UDM Downloads > Excel to Outlook Software! Have you convert you important MS Excel database or contacts (.XLS) file into MS Outlook contacts (.PST) file? Don't worry! 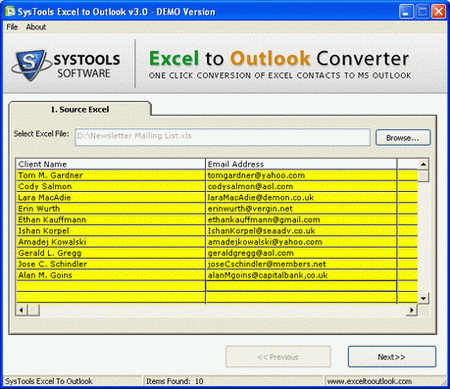 SysTools Excel to Outlook software helps you to convert or transfer unlimited or multiple Excel contacts to Outlook file without Excel contacts lost. XLS to PST converter utility developed to convert full MS Excel contacts like as First Name, Last Name, full Name, company Name, email address, address state, and address country into MS Outlook in a correct way. Imports Excel to Outlook contacts tool is not only easy to use - this tool will offer you to 100 % helpful result. Transfer Excel to Outlook contacts software also convert contacts of CSV (Comma Separated Value) file to MS Outlook file. Export Excel to Outlook utility easily supports all versions of MS Excel (97, 98, 2000, 2003, 2007 and 2010) and MS Outlook version (97, 98, 2000, 2003, 2007 and 2010). Excel to Outlook contacts software creates a distribution list of Excel contacts and after that user simply convert distribution list to Outlook. Excel to Outlook converter software helps you to move duplicate Excel contacts. Try demo version of SysTools Excel to Outlook software to convert first 10 contacts of Excel files. After evaluating the software get full version 3.0 of Excel to Outlook Software for convert all MS Excel contacts to MS Outlook just at $69 (Personal License), $199(Business License) and $299(Site License). Convert XLS file to Outlook software by SysTools Software provide you Bundle Offer for "Excel to Outlook" and "Excel to vCard"(Two Software) with 40% OFF and you can get at $89(Personal License).